2018 TVS Wego has been launched in India with minor feature upgrades. It gets some visual changes, a 20-litre boot space, and a pass-by switch. The prices of the scooter start at Rs 53,027 (ex-showroom Delhi). The 2018 TVS Wego has been launched in India. The 110cc scooter receives some visual upgrades and minor feature upgrades. The starting price of Wego is now Rs 53,027. Wego is one of the underperformers of TVS. At the time of its first launch, it was one of the best sellers as a comfortable and sturdy scooter. After Jupiter, Wego lost out its mark in the same 110cc category. Now, Jupiter is one of the best sellers of India in this year. The 2018 TVS Wego gets a new set of graphics, new colour options, a sporty seat, 20-litre utility box, sporty wheel-rim stickers, and a pass-by switch. The new colour options include Red, Blue, Grey, and Black. Other features onboard the 2018 TVS Wego include a fully digital speedometer, external fuel-filler cap, LED Taillamps, dual side handle lock, USB Mobile charger, and an optional Disc brake. 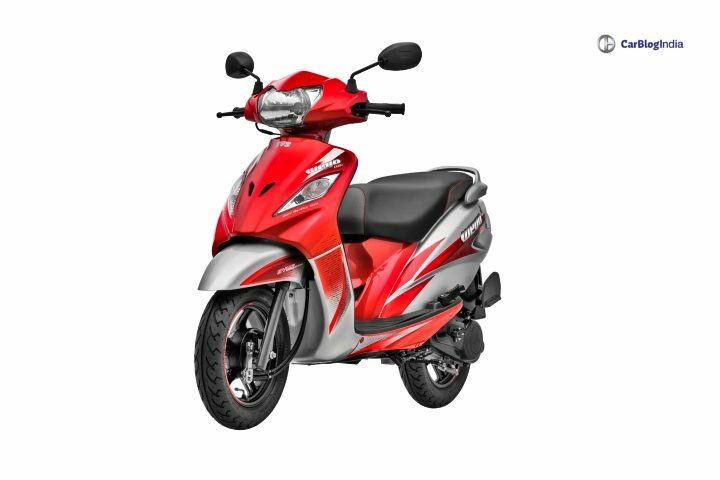 The Wego gets a full metal body, which adds up for to the safety of the rider. It also comes with a Sync Brake system. Mechanically, the Wego remains the same. It comes with a 110cc engine that produces 7.9 HP power and 8.4 Nm torque. The engine comes paired to CVTi transmission. The fuel capacity of the scooter is around 5 Litres, with an approximate mileage of 55 kmpl. The total riding range goes up to 250 kms on a full tank. The Wego uses Advanced Telescopic Function in the front and Unit Swing Hydraulic at the rear. For braking, it uses front and rear drum brakes with an option of a front disc brake. Also, it gets the longest wheelbase in the segment at 1275 mm. The TVS Wego goes against the likes of Honda Activa 5G, Suzuki Let’s, Mahindra Gusto and Hero Maestro Edge. TVS already has Jupiter in this particular segment, which is the second best selling two-wheeler for the past few months.